Are you struggling to do great looking color separations for photos and high-end images? Or do you have a simple JPG and you can’t figure out how to separate it? Do you wonder how the big guys do it? They have T-Seps! If you want to creating stunning screen printed images on light and dark shirts then you should take a look at the #1 color separation program in the industry. 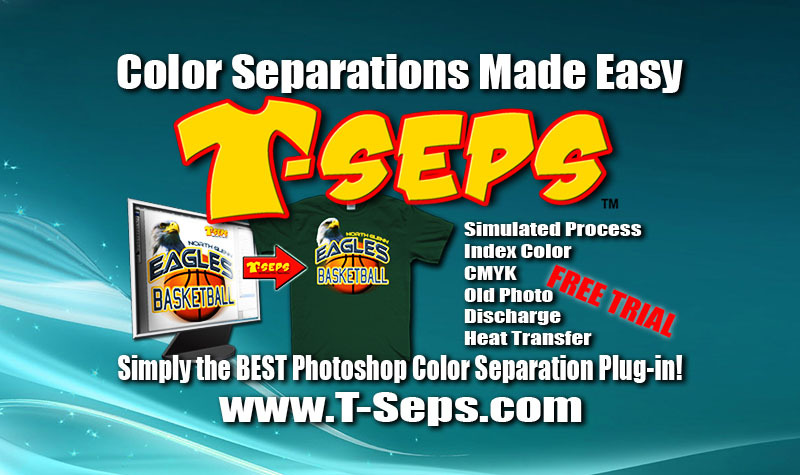 T-Seps is the big brother to the very popular FastFilms (over 9,000 users worldwide) and it automates doing color separations in Adobe Photoshop. In a matter of minutes you will have a great set of seps. Plus, the program tells you the mesh count, print order, ink color and more. T-Seps is actually 14 programs in one. It does a variety of separation types including Simulated Process Color, Index Color, Heat Transfers, CMYK, Spot Color, Old Photo, Discharge Ink, and more. Plus it has dozens of routines to clean up artwork, create edge effects and the distressed look, convert the files to halftone dots and more. Don’t worry if you don’t know Photoshop. You get our complete Adobe Photoshop Master Class FREE with the purchase of a full version of T-Seps. 27 videos! Are you a Corel or Adobe Illustrator user? No worries. Create the image in your favorite vector program and use all the colors you want. Open the file in Photoshop and separate it in a matter of minutes with T-Seps – including getting a great underbase and highlight white! It works on Mac or PC and is compatible with any version of Adobe Photoshop including all CC versions! And, it works on Windows 7, 8, 8.1, and 10 and of course all Macs. Before you buy any other program that claims to be the best – download and try T-Seps. Check it out HERE and download a FREE 20 day trial today.